I normally make rustic bread instead of the soft and sweet one as we prefer having it with jam or Nutella. 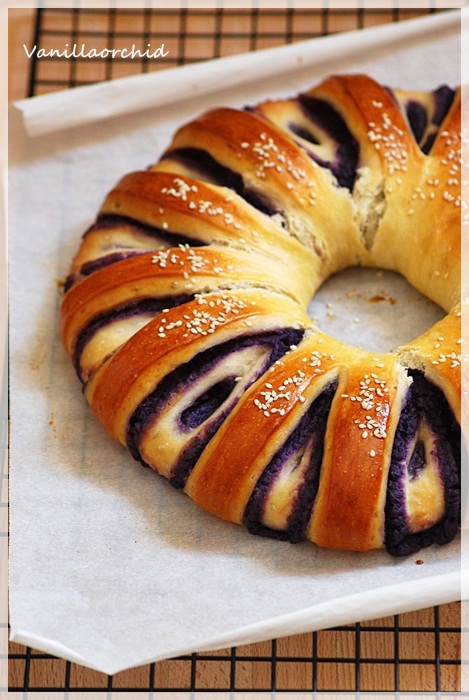 Last week I got some purple sweet potatoes and I thought about making bread with potato cream filling. 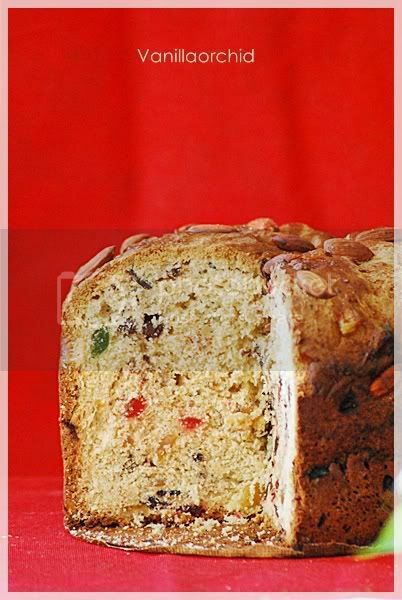 So, let’s go to bake sweet bread! 1.Cut the potato in small pieces and steam until it cooked. 2.Mash the potato and mix with sugar. 3.Melt the butter with milk and put the mashed potato and cook for 5 minutes. 1.Mix together flour, sugar and salt. 2.Make a well in the center and pour warm milk, warm butter and yeast, stir to make a soft dough. 3.Knead for 10-15 minutes by hand until the dough is smooth and elastic. 4.Place in an oil bowl and turn the dough to coat in an oil and cover with clingfilm or tea towel and place in a warm place to rise until doubled in size, about 1 ½ hrs. 6.Roll the dough into a rectangle measuring 20 x 30 cm. 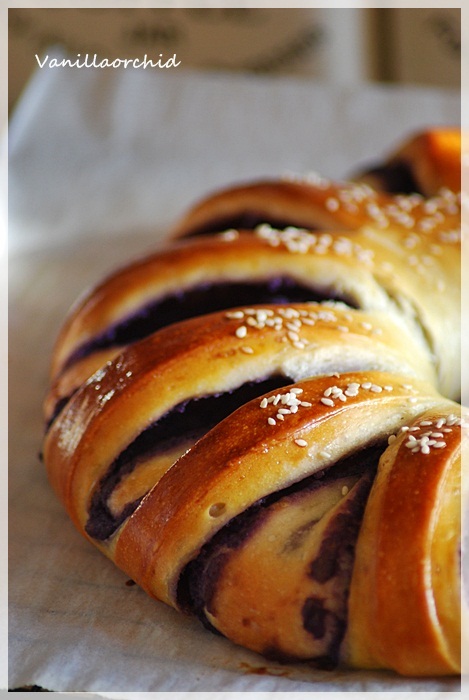 7.Spread sweet potato filling and roll up from one of the long sides and pinch the dough where it joins to seal. 8.Make 6 incisions with a knife. 9.Shape into a ring and pinch both sides together. 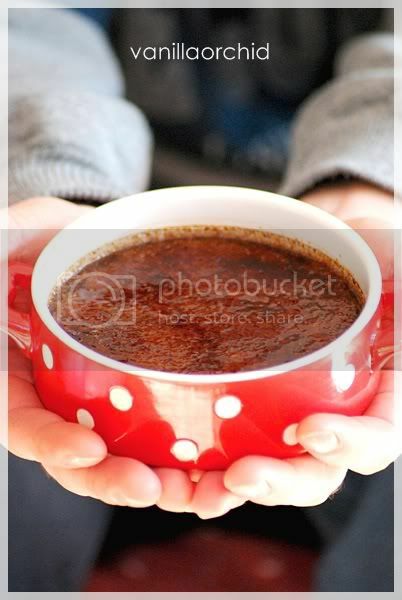 10.Leave to rise in a warm place for 40-50 minutes or until doubled in size. 11.Brush with egg wash and sprinkle with white sesame. 12.Preheat the oven to 180° C.
13.Bake for about 25 minutes (depends on your oven), I covered the surface with tinfoil for the last 5-10 minute to avoid the bread turns too brown. Hmmm… how long I have not made chocolate? Maybe 1 or 2 year! I like making chocolate when I am free from everything: washing dish, cooking a meal, cleaning the house, doing my hobbies, etc. 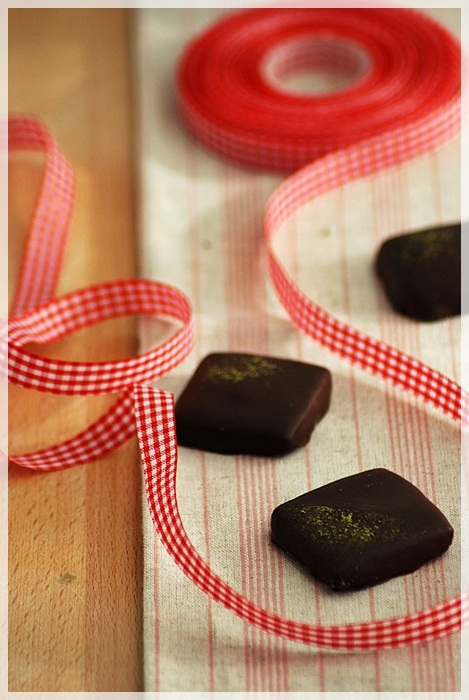 For me, the making of chocolate is like an art, so it deserves time, attention and you have to let yourself go with it! Usually when I am at home, I like doing a lot of things, Paolo and his mom always ask why I cannot just do nothing and relax!! I’m kind of hyper!!! I have been thinking so many times to make chocolate and last week I told myself that If I don’t make it now maybe I have to wait till next year and yesss I do not have enough patience to wait so long! 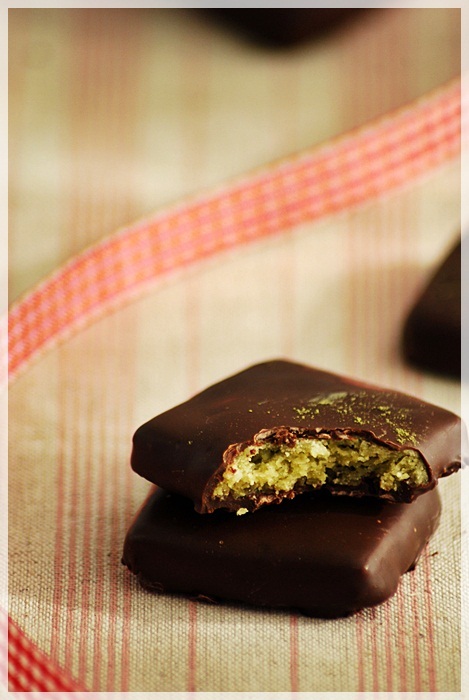 When I saw this recipe, I just oh….I gotta make it as we like shortbread but I have some doubts because it’s green tea shortbread. Not everyone like matcha green tea and Paolo is one of them as he seldom chooses green tea cake or green tea ice cream. I was quite sure that he would have liked it because he’s mad about shortbread and chocolate! 1. Sift flour and matcha powder together. 2. Put all the ingredients, except the tempered chocolate, into a bowl and mix unitl the ingredients come together in a dough. 3. Remove from the bowl. 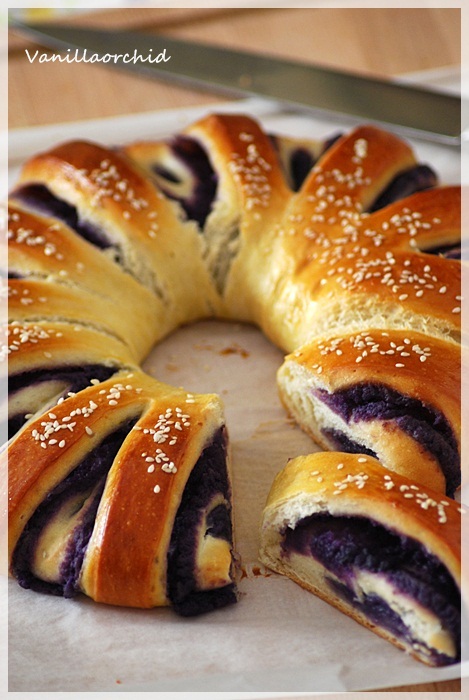 Roll the dough to ¼ inch thick on a lightly flour surface. 4. Cut into 1 ½ inch squares and transfer to a baking sheet and leave to rest for at least 1 hour in the fridge. 5.Preheat the oven to 160° C.
6. Bake for 20-25 minutes until lightly golden. 7. 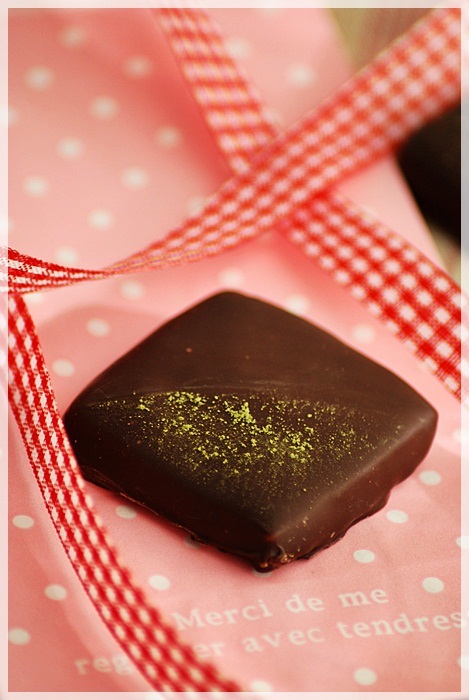 Leave to cool on the rack and dip in the tempered dark chocolate and dust with matcha powder. 1. 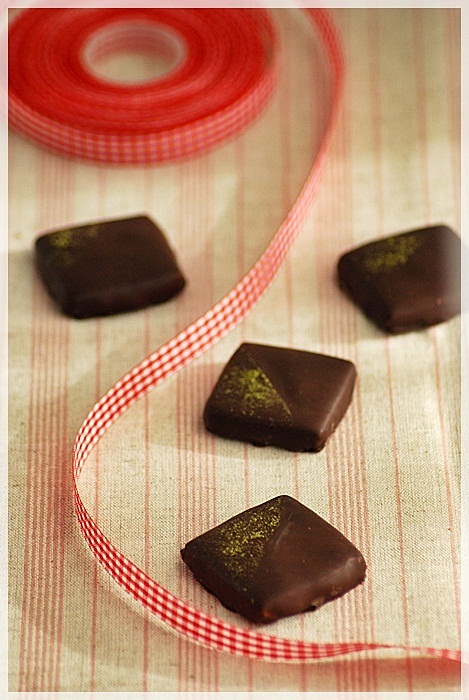 Place 2/3 of the chopped chocolate into a double-boiler or over a bain-marie (water bath). Do not boil the water, as it may scald the chocolate. 2. 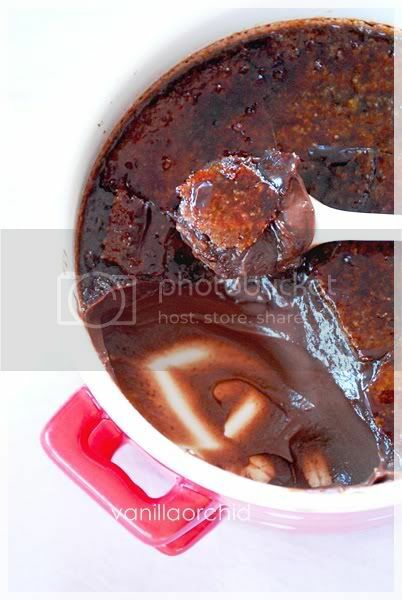 Stir regularly until the chocolate has completely melted and reaches 45-50° C.
3. Gradually add the remaining chocolate, stir vigorously and continue to stir until all of the chocolate has fully melted and the chocolate cools and thickens to 32° C –keep checking using a thermometer. If the temperature drops below this, simply warm it up over the bain-marie again. It’s very tasty and it’s also a good idea for Christmas gift. One of my closest friends came to visit me 2 weeks ago , so I took the chance to bring him for a city tour on Saturday afternoon; walking along the streets I found that there were already all the lightful Christmas decorations, and for sure I could not miss to show him the famous Christmas market. I like going there although I seldom buy stuff there, but I love the atmosphere and the passion in this fest: the stalls, people walking from one stall to another and the murmuring of chit-chatting. One thing I enjoy so much is sipping vin brulè, a seasonal beverage made of red wine, sugar and spices. It drives me mad especially when I am sharing it with friends under a snow fall. Even if I am a Buddhist, I love Christmas very much: this is the celebration when families spend time together, eating, chatting, laughing and playing bingo (it reminds me of Thai New Year because we celebrate almost the same way). I like my time in the kitchen; when I am at home I spend most of the time there: I cook, listen to the radio, surf the net on my computer. With Christmas approaching I am there even longer. In one month it will be Christmas, as every year I prepare various cookies to present to family and friends. 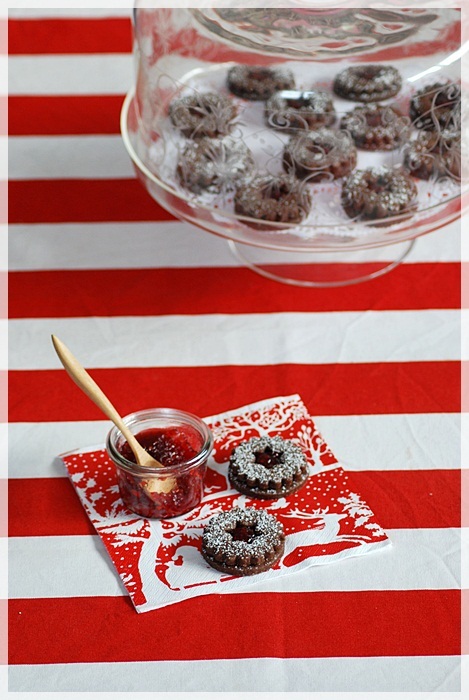 Our favourites are ginger bread decorated with icing sugar and sugar cookies with jam. As chocolate is a must for us , this year I want to make chocolate cookies and I’m sure that I will make Paolo happy with this. 1.Sift together flour, cacao powder, salt and baking powder. 3.Add egg and vanilla extract and beat until combined. 4.Add the flour mixture and beat until you have a smooth dough. 5.Dived the dough in half and wrap with plastic wrap. Put the dough in the fridge for about one hour. 6.Preheat the oven to 175 degrees C.
7.Remove the chilled dough from the fridge and roll it out on a lightly floured surface to a thickness of ¼ inch. Cut out the dough using cookie cutter shapes, I used round and flower with a hole of star in the middle and transfer to the prepared baking sheet. Place the baking sheets in the cool place for 10 minutes (to prevent the cookies from spreading and losing their shape while baking). 8.Bake cookies for about 12 minutes (depending on size and oven) or until they are firm around the edges. 9.Let cookies cool on baking sheet a few minutes before transfer to a wire rack. 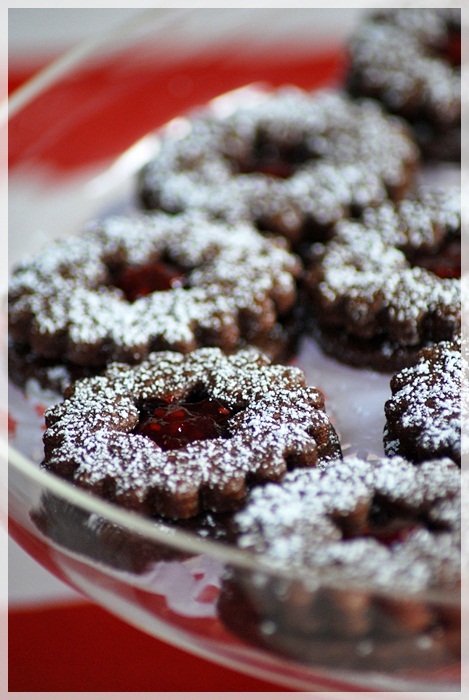 10.Put the jam in the middle of the round cookies and put the flower cookies on top and finish it with icing sugar. One cloudy day in the middle of autumn, I was at home sitting on the couch looking through the window, thinking how cold it is going to be. I felt like wishing to warm up and fulfill my house with a great scent from my oven. We are big fan of chocolate, especially Paolo (he’s absolutely a chocolate monster) . Normally I make chocolate cake and dessert more often than other cakes, but I realize that I seldom make chocolate cookies, how come? 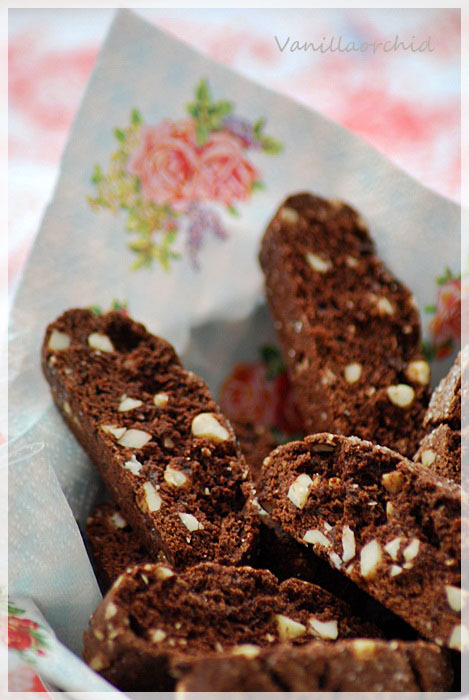 I love biscotti, so this time I went for them, and I crossed my fingers that Paolo will enjoy them as well. Since then, I have made them twice already as we are crazy for their nutty crunchy and full of chocolate flavor. 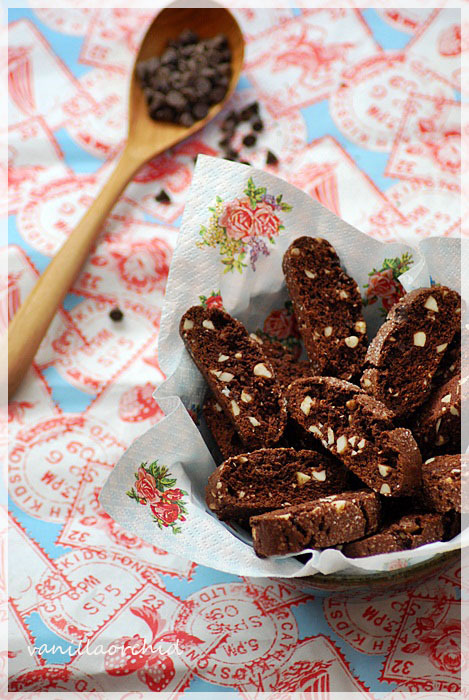 I will make them again and again as they become one of our favourite biscotti. 2.Sift together the flour, cacao, espresso powder, baking soda, baking powder and salt. 3.In a large bowl using a hand mixer beat the butter and sugar together on medium speed until pale,about 2 minutes,the mixture may be crumbly. 4.Scrape down the sides of the bowl, add egg and vanilla and beat for another 2 minutes. 5.Reduce to low speed and mix the dry ingredients in 2 additions (or using a wood spoon to combine to dough), mixing only until a dough forms. 6.Mix in the chopped almonds and chocolate chips, then turn the dough out onto a work surface. 7.Divide the dough in half, working with one half at a time. 8.Roll the dough into 9-inch-long logs, flatten both logs with the palm of your hand, so they are about 1/2 - 1 inch high, 1 1/2 inches across. 9.Carefully transfer the logs onto the baking sheet, sprinkle each log with a little sugar. 10.Bake the logs for about 20 minutes or until they are just slightly firm. 12.Using a long serrated knife cut each log into slices between ½ and ¾ inch thick. 13.Stand the slices up on the baking sheet and bake them again for 10 minutes. 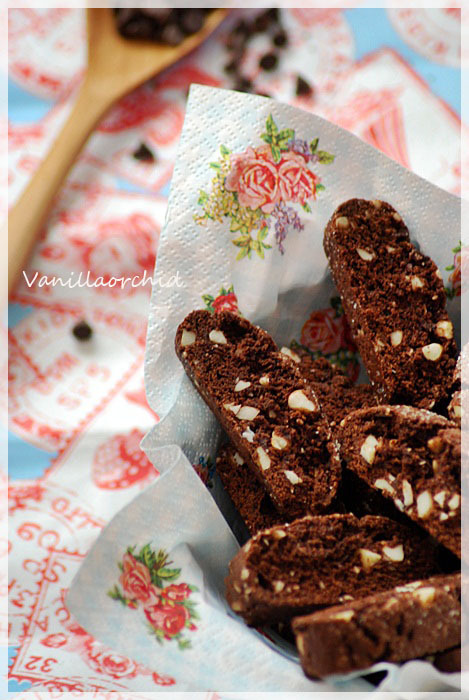 14.Transfer the biscotti to a rack to cool. 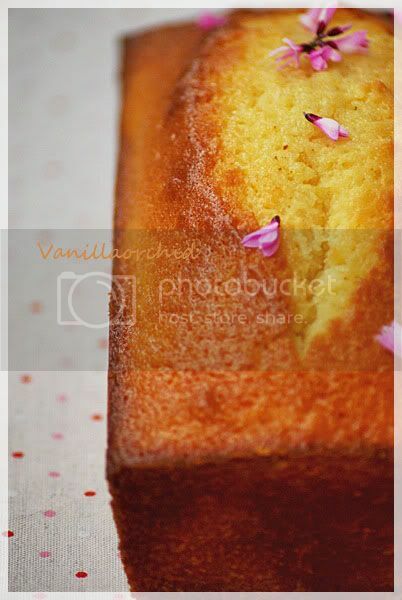 I have to admit that I have not had idea about Yogurt cake before until one of my friends told me about this cake! I was curious to know it so I immediately went to my book shelf to find more about it and I found many recipes. I went straight to the kitchen to try some of them. After some trials I finally found the one I love the most. 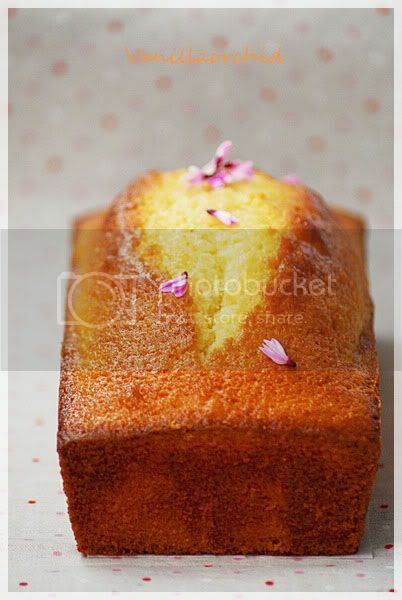 Till now I have baked this many times as it's not only delicious but it's very simple to make. 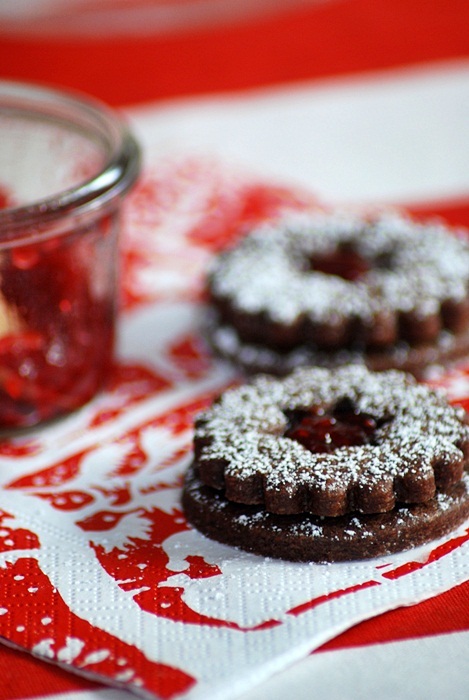 The recipe from the book “Baking from my home to yours” by Dorie Greenspan. 1. Preheat the oven to 175-180° C.
3. Put the sugar and zest in a bowl using your fingertips to rub the zest into the sugar until the sugar is moist and aromatic. 4. Add the yogurt, eggs and vanilla and whisk until the mixture is well blended. 5. Add dry ingredients using a spatula and fold in the oil. 6. Scrape the batter into the pan and smooth the top. 8. Let it cool in the pan for 5 minutes before taking it off. 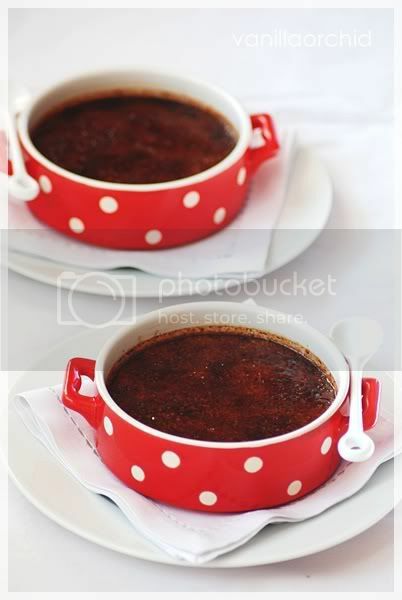 Double delicious : Chocolate crème brulee, delicious treat for the chocoholic in you. I like having dessert with custard especially with some cake. I love the taste and the texture of its, but I dislike having only custard as dessert!! Last week, I talked to my friend telling her that I really want to eat Crème Brulee but I don’t like the traditional one. I have thought making it with Earl grey or berries tea just having some aroma. The day after, she told me that she just made Chocolate crème brulee which made my heart beat and I almost scream out loud. 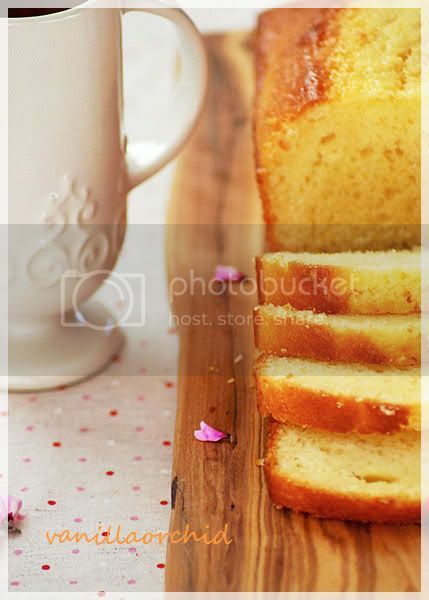 She said that because of me, she went to check out her baking book and found out this recipe. She said that it's so delicious and hand me immediately the recipe. My husband and I are chocolate lovers so, I did not hesitate to make it ASAP, but after looking in my fridge, I gotto wait the next day because I ran out some ingredients... poor me!!! I made half recipe and modified it as I did not have enough ingredients. 2. Put the cream, milk and sugar in a large saucepan and bring to boil. 3. Remove from the heat and add the chopped chocolate and allow to stand for 2 minutes. 4. Then stir until smooth. 5. Beat the yolk with an electric mixer until its light colour. 6. Add the chocolate mixture and beat until combined. 8. Put the dish and ramekins in a tin and add enough hot water to the tin. 9. Bake for 35 minutes (depend on the side of the dish and the oven temperature) or until the custard is set. The custard should be slightly wobbly in the center. 10. Remove the dish from the tin allow to cool. 11. Sprinkle the surface with the brown sugar use a small blow torch to caramelize the sugar. It's absolutely delicious; you can have sweet and smooth texture with scent of toffee at the same time. Thank you my friend, Pook from daily delicious blog. 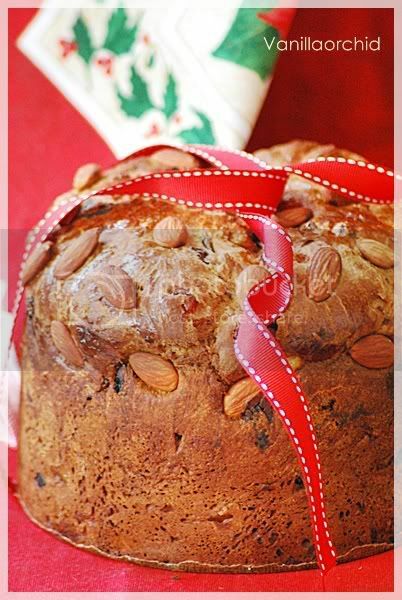 Last year I tried to make Panettone, Italian traditional Christmas & New Year cake but I failed. Fortunately I found the simple recipe on GoodFood magazine, Jan'10 and I immediately went to the kitchen as I was eager to make it. It's not complicated and the result is quite close to the one we can get from the shop except the one from shop is softer and made with less ingredients. 1. Mix briefly flour, yeast and salt into the food processor fitted with a dough blade. 2. Add the sugar and mix again. 3. Warm the milk just warm and in a separate bowl, beat the eggs with the vanilla bean. 4. Add both the milk and eggs to the dry ingredients and mix to soft dough then leave in the warm place until doubled in size, about 1 hrs. 5. Put soft butter into the dough and pulse until incorporated, leave for another 1 hour to rise again. 6. Add raisins, candied peel, dried fruits and chocolates to the bowl then pulse to mix evenly. 8. Tip the dough out onto a lightly floured surface and knead briefly to shape into a ball. 9. The dough is very soft, better to flour you hands well before handing it and work quickly. 10. Drop the dough into a tin (I used the Panettone tin) and leave to rise for 30 mins. 11. Heat the oven to 180° C/ 160° C fan. 12. 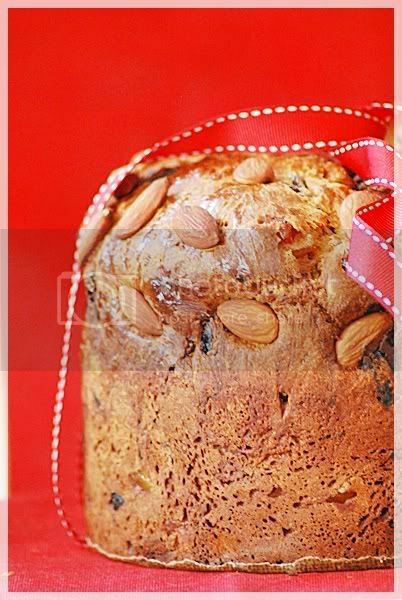 Brush top of the dough with beaten egg and spring the almonds. 13. Bake for 40-50 mins until the well risen and deep golden brown.